While we regularly hear all the buzz about the new iPhone and the new Nokia N95, JL Smith of Mobizines came out with the top 10 crap mobile phones of all time and I happened to own some of them and I must say it fits into his crap criteria. Here are his top 5. 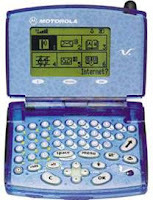 Actually, the 7110 wasn't the worst phone ever and I had one of this too. As a phone (for making phone calls) it worked fine, with triband GSM and a really usuable UI. Its reason for getting in the list is that it was the first phone to demonstrate exactly how much WAP was going to underdeliver. "WAP is crap" started with this phone, although that really isn't the phone's fault. The other reason it's here is for the spring-loaded keypad cover which was slick as you like for 1999, but required the owner to hold it at exactly the right angle to work properly. And you had to put up with loads of people telling you it wasn't actually the phone used in the Matrix. This phone came out at the same time as the Nokia 7110 when I was working for a company developing some of the first WAP sites. You could get either the 7110 or the 7389 from O2 and my colleague Ben volunteered to get the 7110. I got the 7389. A week later after missing dozens of calls and still unable to find my texts I swapped it for the 7110. Just for the genius decision that you couldn't start calls from the missed calls register. If you could find it. Er...but...The new OS is much better. Partly for the notion that you could beat Nintendo at mobile gaming, but mostly just for the genius placement of mic and speaker. It's a pager. Not a phone. You can't fool me, I'm a professional. Its the most ridiculous mobile phone ever designed, and I had one of this too. You cant pick up a call without a headset and mic. Can you imagine carrying the headset everywhere you go and its not as if there was bluetooth headset in those era. It was doomed for motorola from day 1.